Check out the many great Amethyst Cast after Anhydrite, Pyromorphite, Fluorite, Stilbite with Prehnite on Calcite, Hematinic Quartz with Calcite, Fluorite on Barite, Calcite, Green Quartz (Prasem) with Hedenbergite Inclusions, Cobaltoan Calcite, Blue Barite on Dolomite, Gem Hessonite Garnets on Matrix, Sphalerite on Quartz, Goethite & Quartz, Spessartine Garnets on Orthoclase, Canvansite on Stilbite, Wulfenite, Arsenopyrite with Quartz & Sphalerite, Shining Apophyllite, Fluorapophyllite on Stilbite, Quartz & Pyrite, Brucite (Bi-colored) on Matrix, "Star" Muscovite with Quartz, Allophane, Stellerite Bow-Tie, Cassiterite with Quartz, Malachite and Gypsum var. Selenite mineral specimens on this page. Pretty, velvety primary Malachite - an uncommon find from the Milpillas Mine. In fine condition. 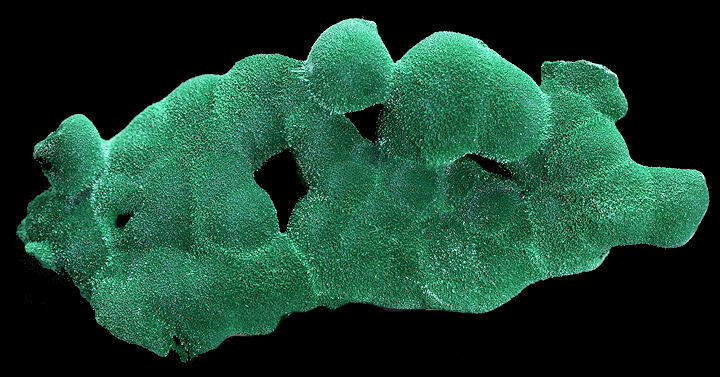 Botryoidal and microbotryoidal growths of Allophane with a turquoise color, and on a rocky matrix. Allophane is an amorphous to poorly crystalline hydrous aluminium silicate clay mineraloid. Its chemical formula is Al2O3·(SiO2)1.3-2·(2.5-3)H2O. In good condition. An amazing sculptural, large Amethyst pseudomorph with sparkly light purple Amethyst that has replaced a large dramatically hoppered, skewed Anhydrite crystal resting on an Amethyst covered basalt matrix. A spectacular, pristine and rare 360 degree pseudomorph. Pretty specimen of light green, gemmy, hexagonal Pyromorphite crystals on matrix. In very good condition. An attractive blue Fluorite crystal cluster from the famous La Viesca Mine. In very good condition. An aesthetic combination of light brown Stilbite and gemmy green Prehnite crystals on Calcite. In very good condition. A stunning, large specimen of snow white Calcite crystals bursting off Hematinic Quartz. In very good condition. Gorgeous formation of white, essentially pristine Barite blades crowned with light to dark purple Fluorite crystals from the famous Berrbes mining area in Spain. A beautiful, intricate, flowerly formation of white Calcite crystals with some light yellow hues. In fine condition. 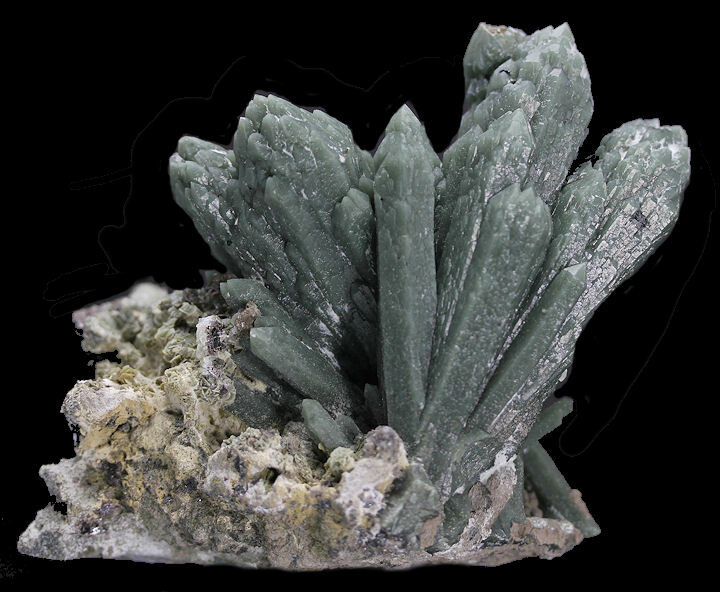 Large, green, lustrous Quartz crystals sprouting from matrix.Coloring is due to inclusions of Hedenbergite. Presents well on both sides. In very good condition. Pretty pink,somewhat gemmy crystals of Cobaltoan Calcite. Wonderful, gemmy, blue Barite blades nicely dispersed on a contrasting white plate of Dolomite rhombs. In pristine condition. Numerous, honey colored, gemmy Hessonite Garnets, measuring to 0.5 cm, richly dispersed on a large matrix. In fine condition. Light to dark amber-chocolate crystals of Sphalerite on a plate of Quartz crystals. In very good condition. Another specimen of green Quartz crystals with inclusions of Hedenbergite, but this one from China. A beautiful cluster and in fine condition. Goethite specimens are very rare from the ancient iron mines of the Rodheim-Bieber area. 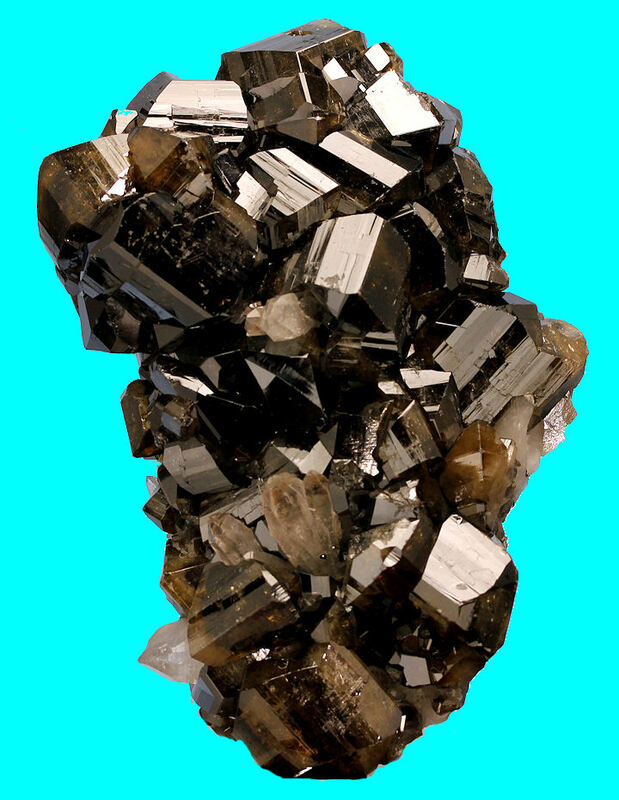 This specimen has a fantastic spray of lustrous gray to brown blades of Goethite, measuring to 2.5 cm. Some of the blades have striking gemmy golden brown tips. The Goethite is nicely set in the sculptural banded to crystallized Quartz matrix. A great, old time specimen in very good condition. An aesthetic specimen of honey colored, gemmy Spessartine Garnets nicely scattered on a contrasting white Orthoclase matrix. In very good condition. A pretty ball of blue Canvansite crystals, measuring 1.5 x 1.5 cm, perched atop a white Stilbite covered matrix. In very good condition. Densely intergrown, parallel-growth clusters of lustrous, translucent, light blue Barite spearpoints form a very aesthetic, mounded, 360 degree specimen. In pristine condition. 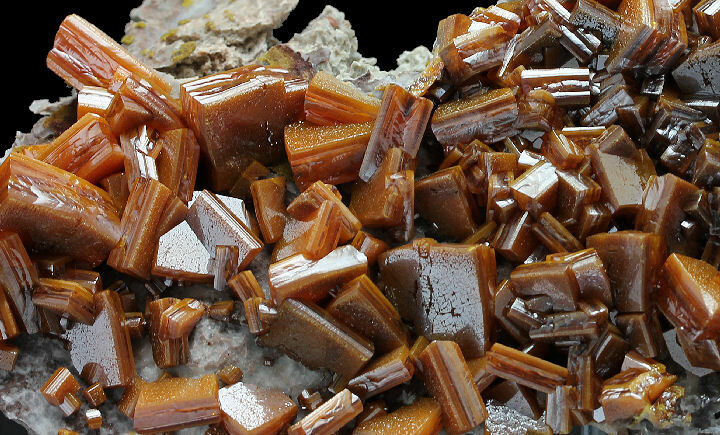 Light caramel colored Wulfenite crystals on matrix. In good condition. Brassy Arsenopyrite crystals with Quartz on Sphalerite. Scintillating, thin plate of super glassy Apophyllite crystals. Sharp pointed Fluorapophyllite crystals on creamy white, lustrous Stilbite. In very good condition. Porcupine like cluster of glassy Quartz crystals with Pyrite. This is one of the Brucite specimens from a limited find in 2017, with a yellow color - a first for Brucite. Normally, Brucite's color is white, which is why I selected this one showing a transition from the more typical white to a bright, lemon yellow color. The second reason I chose it - is that it's on a matrix, which is less common for these specimens. In fine condition. A beautiful and rare specimen. Aesthetic specimen of lemon yellow, "Star" Muscovite crystals with Quartz. In very good condition. A stunning Stellerite Bowtie from a recent find. The lemoning color is rare for Stellerite. In fine condition. Gemmy to translucent, golden brown crystals of Gypsum var. Selenite trimming a solid Selenite hub. In good condition. 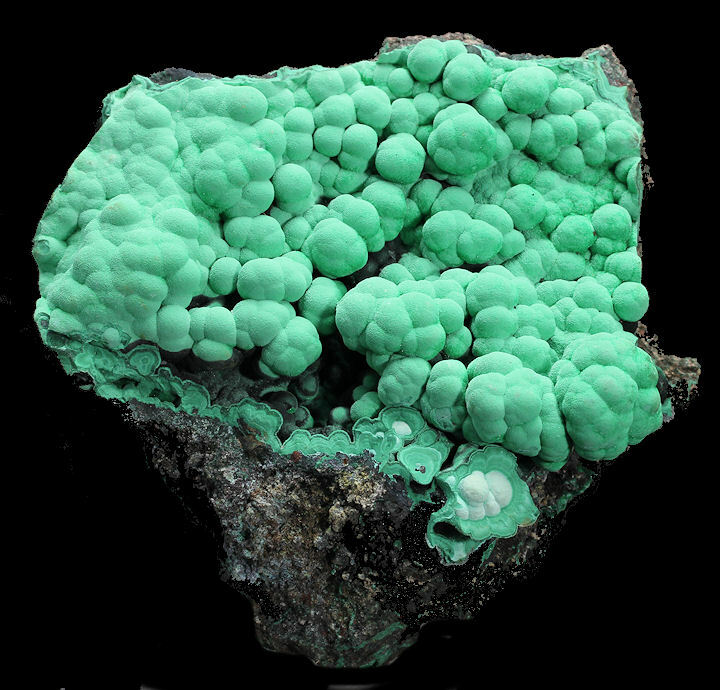 Gorgeous formation of light green, botryoidal Malachite on matrix. Superb specimen of highly lustrous, twinned, light chocolate brown Cassiterite crystals with Quartz. The Cassiterite crystals are more translucent to gemmy than common. Fine condition. 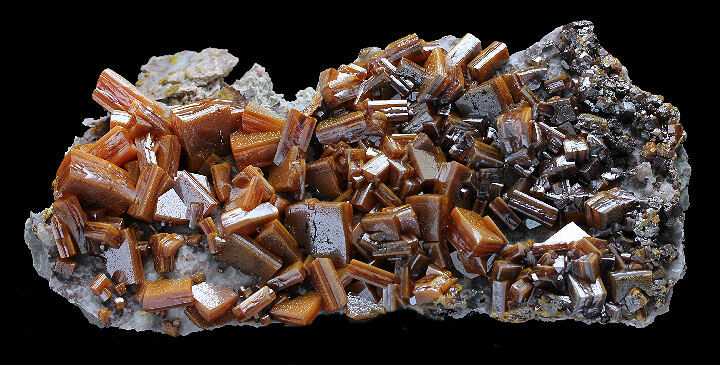 Super plate of sandwich style blocky crystals of Wulfenite (to 1.5 cm) with butterscotch to chocolate color and high luster from the famous Los Lamentos location.